“What we miss – what we lose and what we mourn – isn’t it this that makes us who, deep down, we truly are." Despite being a dog-lover, I avoid reading books about dogs (I am, indeed, one of those readers who anxiously wonders: “Does something bad happen to the dog?”), but I felt compelled to give this one a try. I was so pleasantly surprised! The Friend is so much more than a story about a woman and a dog (although there is that, too). It is a beautifully written story of grief and friendship and love . . . and writing and teaching and reading . . . with plenty of philosophical musings on old dogs, too. I loved the writing style – the “snippets” of (seemingly-but-not-quite) random thoughts interspersed with narrative stories and a bit of philosophy. The writing has a certain appealing snap to it – which I love, and reminds me (as many others have already pointed out) of Rachel Cusk. Perhaps it is the timing of my reading this novel that made it so special for me. After all, I’m still grieving the death of my mother (while not suicide, her stroke still robbed me of all opportunity for closure) AND I have a much beloved - but elderly – Labrador Retriever. So much to love in such a small package. 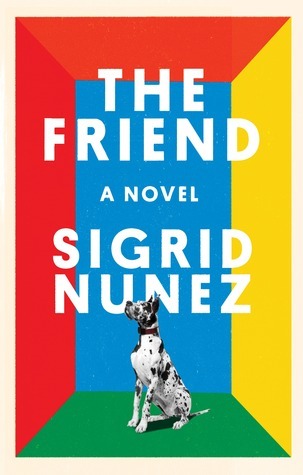 Sign into Goodreads to see if any of your friends have read The Friend.